Nektar made their name with hi-tech keyboards that focused on integration with Propellerhead’s Reason. Their current top-of-the-range Panorama master controllers are highly regarded and extend their advanced DAW integration to many other packages. In the last year or so Nektar have widened their reach with the more budget-conscious Impact GX and LX ranges. The latest addition is the LX88+, an 88-key USB keyboard with drum pads, knobs, and faders that’s surprisingly affordable, yet still has much of the advanced DAW magic of the luxury models. I was a bit concerned about accommodating a full-size 88-key controller in my rather cosy studio, but the LX88+ is light and trim; narrow enough to slide under my desk on a keyboard stand when not in use. It’s also bus powered (!) which made it easy to move about, all of which must be music to the ears of laptop-based keyboard players. The LXs can’t help but look utilitarian next to the gorgeous Panoramas, but the build feels solid. I like the gunmetal grey finish, although I did find the dark colour and sparse lights meant that in low light I struggled to see the labels on the controls. While you could simply plug in the LX88+ and get generic MIDI keyboard functionality, you’d be breaking the hearts of the crew at Nektar. The Nektar keyboards are all about advanced DAW integration. This means downloading the files for your DAWs of choice, and following the setup instructions. Luckily the installation side is taken care of by proper grown-up installers, without any manual poking around in your system. Installers are provided for (take a breath): Logic and GarageBand, Cubase and Nuendo, Reason, Bitwig, Digital Performer, Studio One, Reaper and Sonar. FL Studio supports the LX with no installation necessary. Once set up, each of these DAWs will enjoy many of the advanced control features which we’ll explore shortly. There are also configuration instruction for Pro Tools, where the Impact appears to use the M-Audio Hypercontrol protocol for a limited subset of functionality. While it’s not unusual to see Pro Tools missing out on functionality with a controller (its eggs are mostly in the Eucon basket and it has limited MIDI controller support in comparison), it’s more surprising that Ableton Live is missing from the top-tier of supported software. There’s no mention of it in the product information or main DAW setup areas of Nektar’s web site. If you look in the Knowledgebase you’ll find a setup guide with a Live Remote Script that you have to install manually. This gives you a single mode with functionality along the lines of MIDI controllers that use simple Mackie Control emulation. I asked Nektar why Live doesn’t enjoy their deeper feature set, and they said, “we would love to write custom integration for Live to the same level as other DAWs, but in order to do so we require Ableton to license an API to us.” I think the key thing here is that it takes a lot of time and work to develop a controller script, and you need to be confident that this will continue to be supported from one version to the next. Preset which gives you five layers of user-programmable assignments. For example, in Logic, if you press the LX+’s Mixer mode button, the mixer view will appear in Logic, and the physical faders will map to it. The buttons map to mutes, and the eight knobs map to pans. There are variations available within the mode, so Shift switches the buttons to solos, and pressing the User button by the knobs will open Logic’s Smart Control view and give you access to these macros from the knobs. Bitwig 8 Track is included with the LX88+ and takes full advantage of the controller integration features.Staying with Logic, pressing the Instrument Mode button will open any virtual instrument that’s on the currently selected track, and the keyboard’s controls will map to it. The knobs have a set of common pre-mapped parameters (Filter Cutoff, Resonance, etc), which are printed in blue on the surface. In Instrument mode the faders typically become envelope controls: four for Amp Env and another four for Filter Env. A second User page of controls is provided for creating custom controls. In Logic this is done with Logic’s own control map feature (which can then be made the default), but in some DAWs like Cubase and Reason there’s a ‘Grab’ mode built into the hardware in which you just wiggle the software control followed by the knob you wish to assign. Some hosts can remember these assignments and recall them automatically for specific instruments. There is also a set of Global controls which do not change with the mode, such as the Transport and Locate functions. Among these are the Track Selectors, which are easily my favourite and most used buttons, letting you quickly move between the instruments present in your project’s mixer or (in the case of Reason) device rack. Alongside these are Patch Select buttons which step through presets within the currently selected instrument. These controls are supremely handy, yet are often overlooked on other controllers. The four-colour LED illumination indicates which pad map is currently loaded and can even tell you which type of MIDI message each pad sends. By default the eight trigger pads play MIDI Notes, and typically park themselves in the right place to play any of the drum instruments supplied with the DAWs Nektar supports. Having only eight does mean banking on most instruments to get to all sounds, but this is mitigated by an excellent feature called Pad Learn, which lets you re-assign pads to specific sounds very quickly. To use this you simply flip on Pad Learn mode, tap the pad you want to change, then use the keyboard to find the drum sound to assign. The last sound you play from the keyboard is remembered by the pad. You can quickly assemble a pool of sounds on the pads and avoid too much banking. Clever! Next to the pads are buttons for selecting the Clips or Scenes pad modes. In Bitwig (which is the only DAW to use the Clips mode) these tie in directly to the Clips and Scenes features of the software. Clips lets you trigger playback and recording of clips. The pads light up to show status: yellow to show where clips exist, green for clips that are playing, and red for recording. 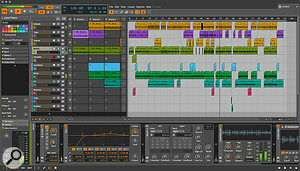 In Scenes mode you can trigger Bitwig’s scenes, and set custom colours. In Logic, the Scene buttons can be used to create and locate to Markers, but it’s Reason that gets the biggest productivity boost. 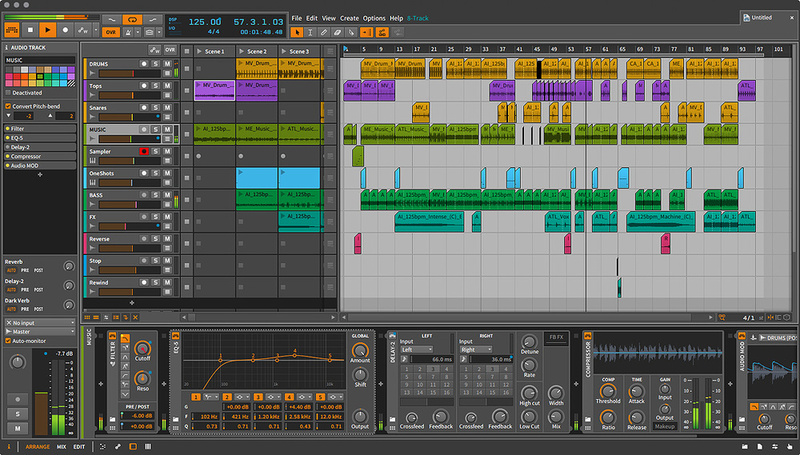 Nektar have set up the Scenes buttons to recall up to 64 loop points in the Reason timeline. By defaults these are four bars long, so tapping the first pad will trigger looped playback from bar one to five; pad 2 triggers bars five to nine, etc. Reason waits until the end of its current bar before skipping to the new position and playback is seamless. This provides a real-time scene-based workflow for Reason that is more fluid than the built-in Blocks feature! You can even change the loop length and where the first loop starts, and as a final flourish the pads are colour coded to show which section is playing, and whether it’s recording. The key differentiator with MIDI controllers now is intelligent software integration; there is a world of difference between a generic MIDI keyboard and a device that can map dynamically to your software, with little or no setup required. In this regard the LX88+ is powerful, yet disarmingly simple. It provides a nice balance of consistent, preset functions without trying to overstretch itself and become complicated. It’s an interesting contrast to the direction taken by some other manufacturers. NI, Akai, and Novation have all created unified hardware interfaces using software intermediaries (Komplete Kontrol, VIP, and Automap) while Nektar have taken a ‘brute force’ approach and squeezed as much as they can from the hardware APIs available with most of today’s DAWs. This leaves you to work directly in your DAW’s native environment. The Nektar Impact LX88+ confounded my expectations. I’d imagined it wasn’t going to be a ‘real’ Nektar keyboard, and instead be a standard USB controller following the template of many others on the market. In fact, despite the lower budget, it’s still quite stylish, and more importantly retains the powerful DAW integration that Nektar are known for. It has a lot going for it. There’s not really anything directly comparable to the LX88+ and its close DAW integration. Other 88-key controllers tend to be purely keys at the budget end, or high-spec, fully weighted models like Akai’s MPK88, Arturia’s KeyLab 88 or NI’s S88 at two or three times the price. If you take a step down to 61 keys then more choices come into play, such as Novation’s Impulse. While the LX88+ lacks the rotary encoders you get on the flagship Panorama keyboards, Nektar have built in a couple of ways to avoid the sudden parameter jumps you’d normally get with fixed knobs and faders. The keyboard maintains two-way communication with the software it’s controlling and reads the settings of any parameters it’s mapped to. It will only begin updating a target when the physical control passes through the current setting point. As soon as you start moving a control that’s not in sync yet, the display reads Up or Down (well, Dn) to show you which way you need to go to catch up. This scheme works for stopping parameter jumps, although I sometimes wished I could just grab immediate control. For one-way MIDI situations, the LX88+ has a ‘Null’ mode which works in a similar way, but remembers where controls were in previous bank or mode positions instead of actively sensing the target. Deep functionality with many DAWs. A simple yet powerful master keyboard with a deep and consistent feature set across many of today’s leading DAWs.